I’ve built hundreds of PC’s in my day. That includes dozens of one-off systems that I’ve configured and assembled for my own use as well as for friends, family, and customers. It also includes batches of new systems that I build during the summer at my full-time job. Below are just a couple of tips that I’ve picked up along the way that make the system-building process as painless as possible. 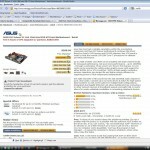 Many retailers provide reviews, which are invaluable when choosing hardware. Building a desktop computer isn’t rocket science, but it’s not work you could assign to a team of chimps, either (with all due respect to the intelligent and majestic chimpanzee, of course). Planning ahead ahead before you go full-force into system building will pay off later by saving you time, money, and frustration. Research your components. Read blogs, forums and industry sites like Tom’s Hardware to find out more about your hardware and whether or not your components will “play nice together.” Google is your friend at this stage of the game. Verify that each component has drivers available for the OS you intend to install before you make a purchase. Make sure your power supply provides enough power to support the rest of your hardware. Make sure your motherboard provides the correct ports for any other hardware and adapters you intend to install. I also recommend reading user reviews for each component on sites like New Egg, Amazon, or MWave. Users tend to write a review when they have a really good or a really bad experience with a product, so they can be a wealth of information and have saved me from countless bad purchasing decisions. Bottom line: Plan, plan, plan! Once your components arrive gather everything you need and plan the order in which you will install them. Have a trash can handy to immediately discard packaging so it isn’t taking up space in your work area. This is the order in which I generally proceed (though your preferences may vary). Open and clear the case. Manufacturers will generally pack any extras inside the case, including wires and a bag of hardware. Sit all these items to the side, and position all cables (power supply cables, front panel header wiring, etc). so they are hanging over the outside of the case. 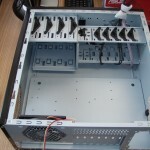 You should have a clear view of the chassis where the motherboard will be installed. Prepare your case to accept the motherboard by installing the brass risers in the appropriate configuration. Replace the metal panel in the back of the case with the one that matches the built-in components on your motherboard. Connect front panel header wires. This includes the power button, reset button, LED lights, and front USB and audio ports. It is easier to deal with these small wires now than trying to fat-finger them around a bunch of other components later. Install CPU and CPU fan. Plug-in and test. If you need to make adjustments, your case is still open and components are easily-accessible. This is how your case should look prior to installing the motherboard. A good case doesn’t necessarily contain 10 fans and light up like the aurora borealis when you hit the power button. Ventilation is incredibly important, but from a system builder’s perspective so is ease of assembly. Make sure your case provides plenty of working room. It’s not hard to damage a motherboard and other components when you have to angle them awkwardly to get them into the case. The following outlines the “no-frills” criteria that I have for cases. These are just choices that I have found to be ideal and they may not fit your situation. Front ports should be located high on the case. When placed on the floor, devices plugged into USB ports low on the case will get kicked and possibly destroyed. No hinged doors unless you have a very good reason for having them. Plastic doors will break quickly. No ventilation shafts. Feel free to disagree but I remain unconvinced that plastic ventilation shafts above the CPU do anything other than take up space and slow you down. Simple drive access. There are many ways that manufacturers can accomplish this (rails , lock-in drive trays), but if I have to unscrew and remove an additional piece of metal to get to my drives and swap them, I’ll look for another case. You should be able to swap drives without disconnecting other wires or hardware. Note: You can solve a lot of overheating and ventilation problems in your case by cleaning out your fans, adding new fans, or simply moving your tower to a location where it can breath. 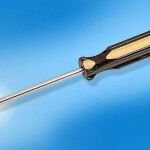 In most scenarios a Phillips head screwdriver is the only tool you will need to build a system. I say magnetic because you will drop screws and they will find their way to the most inconvenient crevice in your new case that they can! Don’t worry about the magnetism affecting your hardware. It’s simply not strong enough to harm your hardware, and I don’t know any other system builders who don’t use one. I say use a good, old-fashioned manual screwdriver instead of an electronic screwdriver or drill because most electronic devices are simply too bulky to use effortlessly inside a computer case. Besides: if you’re not careful you risk stripping out or severely over-tightening your screws, both of which will make adjustments a pain in the future. Note: You may also need a flat-head screwdriver for installing and adjusting certain types of CPU fans. Whether you ground yourself with an anti-static bracelet or an intricate alligator-clip and wire system, make sure you are properly grounded to avoid shocking your new components with static electricity. Damage caused by static is difficult to diagnose but very simply to avoid. 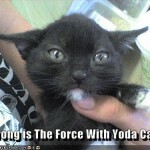 Yoda Cat says, "force components you will not!" If screw doesn’t seem to fit or if a component doesn’t seem to snap into location easily, do not force it. Step back from the situation and analyze it for a moment. There are usually at least two different sized screws used when assembling a computer, and you may be using the wrong one. If your memory doesn’t seem to snap in, it may be backward or you may be trying to install DDR 1 memory into a DDR 2 slot. If an IDE cable doesn’t want to push into a port with ease, try flipping it in the other direction. Though occasionally you may encounter a screw hole bored slightly too narrow you should always think twice about forcing it through. You could strip out the hole or the screw, making removal of the hardware difficult later. Forcing components and connection wires can easily damage pins and leads and ruin expensive hardware. Think about the situation before you manhandle components or use other tools to force a solid connection. Practicing wire management prevents mistakes and make maintenance tasks simpler. 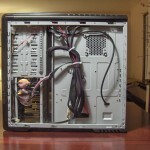 In my opinion there are no hard and fast rules as to how you should effectively manage the cabling inside a computer case. When building systems I inevitably find that I have several twisty-ties left over from the component’s packaging, and I save them for tying up and organizing wires. Most cases will provide holes along the edges where a tie can easily be inserted to wrap up and tighten wires. Make sure that all wires and cables can reach from their origin to their destination, but keep the slack far away from CPU and case fans. It’s best to handle this before you put the case back together, otherwise you will waste your time later reopening the case to make adjustments. Note: Though the plastic fan blades in a PC probably won’t damage wires if they strike them, stray wires can cause fans to stop working and thus overheat and possible damage your CPU. With a little bit of planning and some common sense it is easy to configure and build a stable desktop computer. Plan ahead of time so you know you are buying reliable components that work well together and support the operating system that you intend to run. Keep organized from start to finish: lay out all of the components and tools you will need, keep your work area clean by throwing out packaging and other garbage as it accumulates, and manage the wires and connections inside your tower by tying them off as you build. Use the right tools for the job, avoid static discharge, and don’t force connections. Using this simple advice you can fully assemble a stable desktop PC within 25 minutes of receiving the components. Questions or comments about this article? Or better yet, do you have your own system building tips to share? Leave a comment below! We’d love to hear from you. https://www.reich-consulting.net/wp-content/uploads/2016/05/Reich-Web-Consulting-Logo.png 0 0 Brian Reich https://www.reich-consulting.net/wp-content/uploads/2016/05/Reich-Web-Consulting-Logo.png Brian Reich2008-10-30 17:49:462015-06-21 06:23:25How Does Fragmentation Occur? It’s a sad fact of life that, as an unrepentant geek, it’s not always possible for me to balance my love of technology with my desire to keep the natural world as healthy as possible. Most of our electronic devices have become cheaper to replace than to repair; and many devices that can be repaired on a budget, such as desktop computers, will still have a limited useful lifespan. Most electronics contain components that are at best non biodegradable and at worst toxic for our environment. What’s a geek to do? Some states in the U.S. have laws against dropping garbage electronics (called e-waste) in landfills; as for those that aren’t yet enforcing e-waste recycling at the state level I’ll say this: just because you can dump your electronics doesn’t mean you should. But I’m not here to lecture anyone on environmental responsibility. For those of you that want to do right by your planet, I wrote this article to suggest ways to recycle, reduce, or reuse your computer equipment and other electronics.